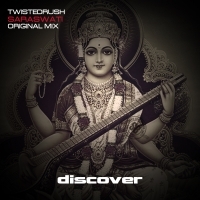 TwistedRush deliver another bomb for Discover with Saraswati. Only just falling out of the key download charts with their excellent previous single Nocturnal, Saraswati raises the bar yet higher with their trademark driving bottom end and strong melodies firing off from all directions. Infectious and charasmatic, Saraswati does notr stand still for a second, a proper trance journey in the truest old school trance style but brought bang up to date for the latest generation of discerning trance lovers. A massive tune delivered to perfection by TwistedRush.